I’ve spoken before about my perspective on Magic finance, and it boils down to this: I do not want to spend cash on cards. I want to have a trade binder full of things people want to get from me so that when I see a card I want or need, then I can get it from them. We use stock market terms all the times in Magic finance. One that I like is use of “frozen” and “liquid” assets. My EDH decks are frozen assets: I am not getting rid of them, short of a dire occurrence. I have got multiple $100+ cards in those decks, and they would make fantastic trade bait. But what could I want more than those? My trade binder is liquid assets. Everything in there is fungible, though I admit that it is a little bare at the moment. I moved a lot of product for shocklands and I’m just starting to trade those away now that they are at $10-$15, since I do not think they will make it much higher. But when the cupboard is bare, what is a casual trader to do? Limited events. I love drafting and I enjoy Sealed tournaments as well. Packs are still expensive but there are prizes and skill involved. I may not be going infinite on Magic Online, but I’m a pretty good drafter, mainly because I’ve been doing it for years and years. Drafting is also a way for me to increase my take-home of cards without spending additional money on more packs. I’m not above picking up a $3 card with my 6th pick. Strategic trading. I’m all for planning ahead; I have posted the list of cards I’ve targeted for guaranteed growth down the road. I am not skilled at predicting what will be good in Standard in three months, but I can feel pretty good about forecasting long-term prices on more casual-oriented cards. I made a ton on Darksteel Plate and Asceticism; I got them both for $1 or less in trade all over the place, and within a couple of years, I traded them away for $5. I’m never going to be a high-volume speculator. I’m married with an infant daughter, and I’m a high school teacher. 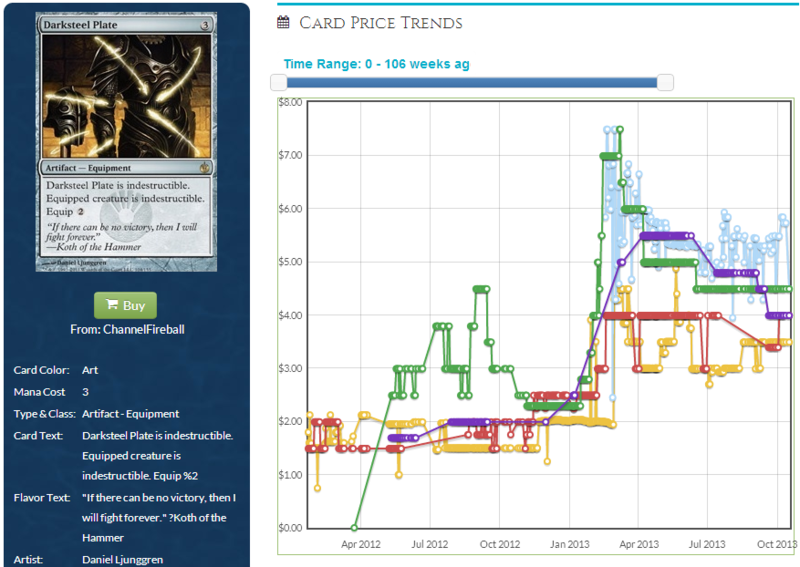 I simply don’t have the time or spare funds for speculating on cards. buying and selling lots of cards. Either way, I’m here to help you capitalize on the casual market. There is far lower volatility, but it does require more patience. I’ve traded for 25 Thespian’s Stage since Gatecrash came out, and I’m still snapping them up when I find them in binders. 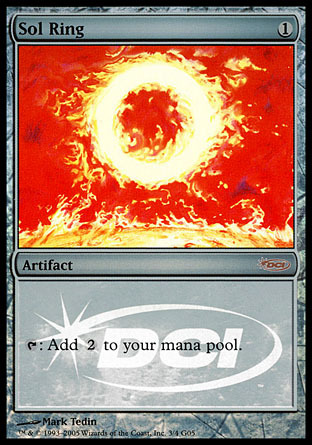 It seems like easy money that these will be $5 lands before long, entirely because they are the best utility land you can be playing in Commander. 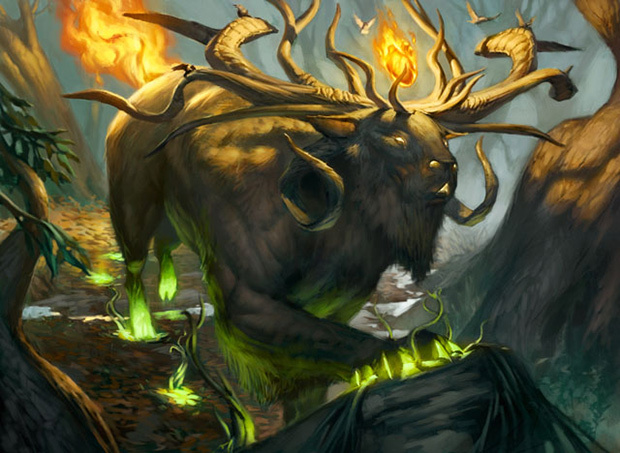 My tip for this week is to stay patient on Theros cards. Lots of them are still coming down in price as more and more get opened. If you have to have it right away for a deck, so be it, but remember that feeling of “I MUST HAVE THIS” when it’s worth 50% of the current sticker price in a couple of weeks.